Sunday's solid swell continued on through Monday, so it was a lightning-quick start at Ponta Preta as the riders prepared to pitch straight into round four of the men's division for the third day at the GKA Kite-Surf World Tour opening round of 2018 in Cape Verde. Pedro Matos beat Matchu Lopes in the first heat - the upset of the event up to that point - before Jan Marcos Riveras dispatched Camille Delannoy and Keahi de Aboitiz booked his place in the semi-finals ahead of Djo Silva. Local shredder Elvis Jose Almeida Nunes then came out on top against Tarifan rider Gustavo Arrojo before Airton Cozzolino beat Aussie charger James Carew with the performance of the round - breaking out the grabbed backroll off the lip before landing back on the wave once again. Next up Ismail Adarzane knocked Ralph Boelen out of the running and then his F-One teammate Mitu Monteiro secured his route to the quarter-finals ahead of Cape Verdean up-and-comer Bernardo Barros. The round finished with a solid finale when, during a heat in which the waves were a little thin on the ground, Sebastian Ribeiro pushed past Paulino Pereira - a rider who many onlookers had tipped for the final after his stunning performance on day two. Yet more drama was to come in this round and Pedro continued his relentless push up the table, taking out another experienced tour rider Jan Marcos Riveras in the first heat. Keahi, who had been pretty much faultless since his first heat of the day, then beat Elvis Nunes before Ismail gave Airton a real run for his money. For a while it looked as though he might unseat the World Champ but it wasn't enough though and Airton took the heat, continuing on towards his eventual victory. The last quarter-final heat was a big one. 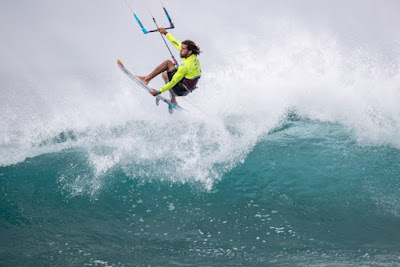 The legend of Ponta Preta himself, Mitu Monteiro, was pushing the wave for all it's worth, hacking turns close in to the shore as his fins churned disaster just above the rocks, but Sebastian Ribeiro was stylish, surgical and making no mistakes. He ejected Mitu from the event, shocking the home crowd that was lined up on the beach. Next up came round two of the women's division in which the losers of yesterday's round one heats battled to stay in the competition. Charlotte Carpentier won the first heat and Spanish strapless freestyle phenom Carla Herrera Oria also secured her route to round three. Local rider, and the sister of Airton, Didi Lopes then built on her previous day's performance to progress ahead of Polish rider Justyna Sierpinska and she was followed by Marie Gautron from France. In the first semi-final heat, Keahi stopped Pedro Matos' meteoric rise up the table with a polished display that underlined just why he has four World Titles to his name. He blended aerials, picture-perfect cutbacks and expert wave reading to take the win. It was close though (and the judges' scoring reflected that) but Pedro pushed him all the way. Airton's heat against Sebastian was similarly tight and, while he undoubtedly deserved his win, it was by a slim margin in challenging conditions with long spells between the sets and the wind becoming marginal at times. This was a clash of the titans, no mistake. Keahi and Airton have competed against each other countless times over the years but Airton had never beaten the Australian in a final heat until today!?? Airton launched into the heat with some of the best aerials we've seen so far at the event, attacking each wave until he was 'danger-close' to the rocks as the home crowd went wild. Keahi responded with his seamless surf-influenced style and his tactical wave selection was just what you'd expect from such a seasoned competitor. However, the conditions were favouring moves off the lip as the heat progressed and that played right into Airton's hands. Airton seemed to feed off the crowd and, by the time the heat drew to a close, it was already pretty clear who the winner was. The man from Santa Maria had done it and, with that, kicked off his season in fine form! Speaking after, he said it was emotional for him to have taken the win at home in Cape Verde. He'd had to fight every step of the way but the glory was his and rightfully so! The mini-final followed as the Brazilians battled for third. Two of the biggest sets of the day rolled through during the heat and both riders, who are solid surfers as well as kiters, looked right at home on their front hand. Sebastian took the heat though, rounding out an impressive event for him during which he's proved himself to be right at the top when the conditions favour more wave-focused riding. Pedro didn't feel hard done by to finish fourth though and, at 19 years old, he was justifiably stoked to have made it to the top four at the end of a long three days of competition! All in all it was an incredible day at Ponta Preta! We hope you enjoyed following the action as it unfolded.